Paragraph Place - Totally Awesome!!!!! 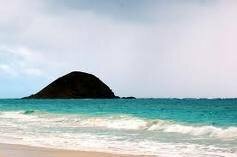 If you want to know more about my vacation in hawaii go on the watcha doin post on comments and suggestions. 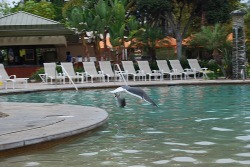 The picture gallery below is all pictures of where i went in hawaii. Click on the pictures to see the captions and then press the arrows to go to the next one. I said I wouldn't update my site while i was in San Diego and i kept my promise. I also said that I would type about it when i returned which i didn't do yet. 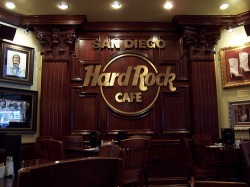 So when i was in San Diego I had a great time. I went swimming because there was a pool literally right across from our hotel room. 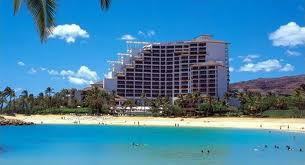 And the other great thing about our hotel is that it is literally right on the beach. So we went on the beach once or twice and then on my birthday,we went into the city. We went to Hard Rock Cafe for dinner and then we went back to our hotel room and i played my brand ne DS game WarioWare D.I.Y, which is amazing. But ever since we got back from San Diego we have been waiting for one thing. 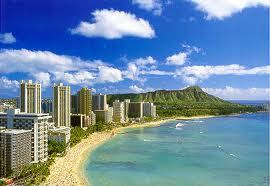 HAWAII HERE WE COME! About 1 month ago when I was driving to San Diego, we stopped at a mission. 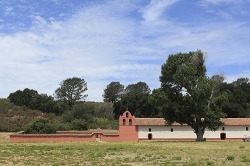 San Juan Capistrano. It is a really pretty mission with an awesome gift shop. They even have a real garden with pumpkins, tomatoes, corn and that kind of stuff. The kool thing about this mission that they didn't have at the other mission that i went to, is that they have numbers by every room, sign or garden. At the front of the mission, they have a little card, with a little machine thing. (They were attatched) And when ever you saw a number you could punch the number things in on your little machine and put your ear next to it and it tells you about it. Last year I went to San Diego with my grandparents, aunt, and my family. This year I am going for my birthday. 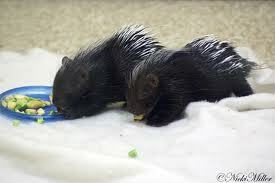 We are going to go to the beach go swimming and we might go to a wild animal park. I won't update my website while we are there but when I get back I will (type) all about it. We went last year and we had so much fun. Our hotel is literally on the beach. 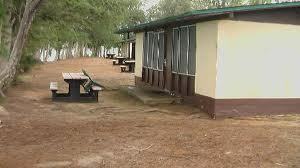 So we will be at the beach a lot. 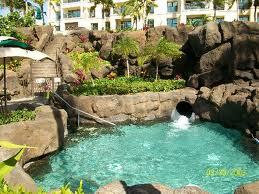 We are staying at the Paradise Point hotel.This is the pool at the paradise point hotel. I can't wait for my vacation! A week from this Saturday, I have a tournament in spring soccer. The teams are world cup teams and I am South Africa. I am really excited to play in the tournament in 1 week and a 1/2. My brother is having a tournament in his division. He is Germany.It will be a very long Saturday, but it will be exciting! This is what my team uniform looks like, but there is a flag on the right side of my uniform and there is no soccer balls on it. There isn't an Adias logo either. Otherwise it is basically the same. The only other difference is that the Green on the sides is way lighter then that on my jersey. 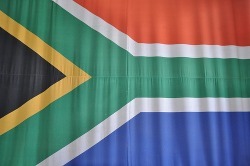 Below this is a picture of the South Africa flag. I am studying the missions at school. I am doing a scrapbook of La Purisima Concepcion and we had to go there yesterday. We went and looked at Chumash huts, rooms that looked almost exactly like the rooms when the Chumash Indians really lived there, there were animals(Bulls, Horses) The Bull was freaking me out! :) Anyway I had a lot of fun at the mission and now I want to go to the other 20! Here is a picture of the mission from far away. After we went to the mission, we went to a "Danish" town in the middle of California! It was really cool. The pancake was way bigger than the ones"here" The town reminded me of the movie "Shrek" I had alot of fun exploring Solvang. There were even windmills! (they were fake. 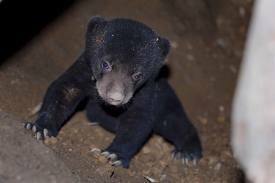 :() I had a lot of fun in Solvang and Lompoc! 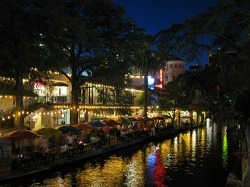 This is a picture of the San Antonio Riverwalk. This is the San Antonio Riverwalk. There was this boat ride that took you through the whole river walk and you got to see all kinds of old buildings. 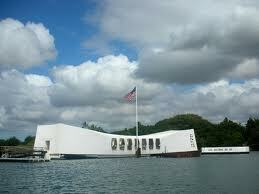 The person in the boat told you at least 2 details about each building or statue. 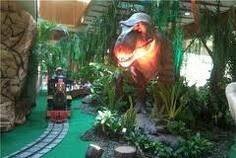 There was this awesome restraunt called Rainforest Cafe. It was rainforest themed. There were moving animals that made noises and every 5-15 minutes the lights turned off and it started making thunder noises. It was so awesome. It has good food too! I think this is a really fun place to go. There is a mall too! 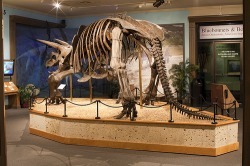 This is the triceratops in the Witte museum in San Antonio. I went here. There was a giant moving dinosaur replica in the outside of the museum. I went on this bicycle that is tied to a rope and it is aparently impossible to fall off. I went on this thing where you sit down and you have to try to pull yourself up to the top with a rope. It was in a science section. The sky cycle was SMF( so much fun) That is like my favorite museum ever. In the dinosaur section( which wasn't my favorite i liked the science section.) but in front of this diagram with buttons is this dinosaur. The diagram had a picture of a dinosaur on it and there was a button on the tail, head, hands, mouth, and feet and if you pressed the head button on the diagram, the head of the dinosaur in front of the dinosaur will move. I love the Witte! I also went to the Alamo mission. It is so small compared to the other missions in San Antonio and most of the other missions in the world. 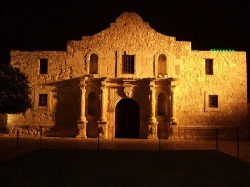 The missions in California are huge compared to the Alamo. There really isn't much to see at the Alamo except the outside of the mission., and a tree so old that some of the branches were held up by poles. 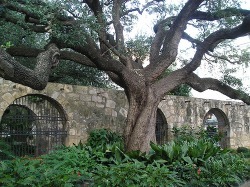 This is the oak tree at the Alamo. You can't see the poles though but really who cares. 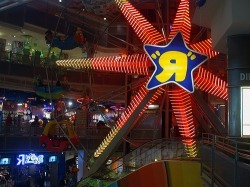 Awesome Ferris wheel in toys r us in new york! When I was 6, I went to New York. I thought the coolest things were the Statue of Liberty, and the 3 story Toys 'R' us. I am going to write about the Toys 'R' Us first though. On the first floor there was a full size ferris wheel in the middle of the store. That is how tall the building is. I went on the ferris wheel and it was so much fun. On the second floor there was a barbie house that you could go in and buy barbies and stuff. Even though barbies aren't really "fun" anymore I still think that was kind of cool. I thought that it was so cool to have such a big Toys 'R' Us and my Dad let me buy a few things to take back home too! It was awesome! I saw the statue of liberty too. I went on a tour close to the statue and I learned a few interesting facts. Anyway I thought the Statue of Liberty was pretty cool compared to Ellis Island. Now that i did a reenactment of Ellis Island in 3rd grade I kind of get it more so it is a little bit more interesting then when i was 6 1\2. Anyway the Statue of Liberty was really cool. And very very very big! This is where you tell me if you went to any cool places AND WANT ME TO WRITE ABOUT IT. If you want me to write about the place you went you can tell me but tell me if you don't want me to write about it tell me that.